TEHRAN, Iran — The Iranian government is warning that it will take “whatever reciprocal measures it deems expedient” if it is not fully compensated for the U.S. withdrawal from the nuclear agreement as provided for in the accord. A lengthy government statement issued Friday said the other parties to the agreement — especially Britain, France and Germany — must safeguard the accord, implement their commitments, and “proceed from giving pledges to taking practical action without any preconditions.”Iran reiterated that no provisions or timeframes in the 2015 agreement “are negotiable in any manner.” It also reiterated that the foreign minister is seeking “required guarantees” from the five other parties to the agreement as well as Iran’s other economic parties.At the same time, the government said it has tasked the president of the Atomic Energy Organization of Iran with “taking all necessary steps in preparation for Iran to pursue industrial-scale enrichment without any restrictions, using the results of the latest research and development of Iran’s brave nuclear scientists.”The statement was sharply critical of President Donald Trump, calling his administration “extremist” and the U.S. withdrawal from the accord “unlawful.” The government said the U.S. pullout damages U.S. credibility on the world stage and the credibility of accords the U.S. has signed, and puts “the present system of international law in serious danger.”The Iran nuclear deal was forged in 2015 during the Obama administration under then-Secretary of State John Kerry, as part of an effort to keep Iran’s nuclear program at bay. 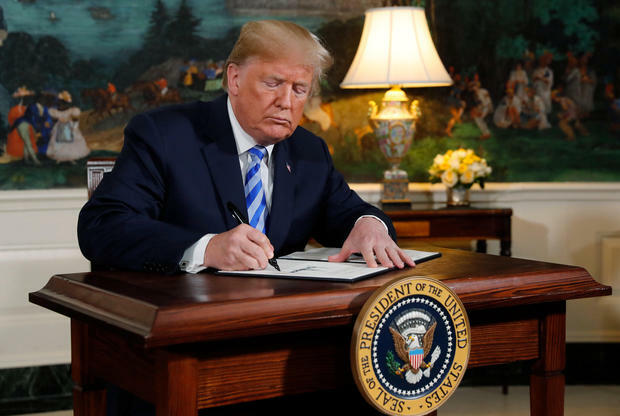 Mr. Trump slammed the deal during the 2016 presidential campaign, saying it was “badly negotiated.” This week, he rolled out his much-anticipated decision to “withdraw” from the deal, in keeping with his longtime campaign promise. 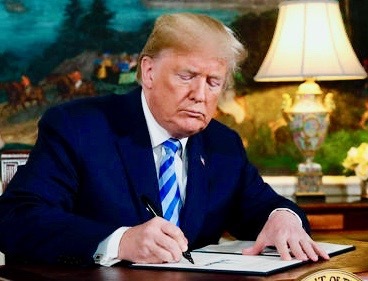 The president claimed Tuesday that there is Israeli intelligence proving Iran is not in compliance with the agreement. The decision to pull the U.S. out the deal will also affect European countries, now trying to figure out how to save billions of dollars in trade. French Finance Minister Bruno Le Maire said on Europe-1 radio that Europe should not accept the U.S. as the “world’s economic policeman.””Do we want to be vassals who obey decisions taken by the United States while clinging to the hem of their trousers?” Le Maire asked. “Or do we want to say we have our economic interests, we consider we will continue to do trade with Iran?”European leaders, including French President Emmanuel Macron, tried to convince Mr. Trump to stick with the deal. Besides concerns over trade, there are fears the decision will stoke conflict in the region. That includes increasing tensions between Iran and Israel in recent days.On Friday, more protests took place in Tehran as thousands took to the streets, reports CBS News’ Elizabeth Palmer. The anti-U.S. demonstrations deflect public anger away from serious problems brewing in the city.